An informative course with good practical exercises. Chicago, the 'Windy City' has traditionally been a global economic powerhouse. Situated scenically on the bank of Lake Michigan, the city has the most balanced economy in the country and its skyline is dotted with a number of Fortune 500 companies. Chicago has the highest minimum wage in the country, recorded the maximum number of new corporate start-ups in the United States and abound with employment opportunities for trained professionals from all over the world. Chicago is often chosen to host global trade conventions and houses the head-office of several well-known corporations. Additionally, Chicago has that has resulted in a demand for skilled professionals from all over the world. To help professionals stay relevant, KnowledgeHut offers a number of online learning opportunities for beginners and professionals alike, and CSD Certification in Chicago is ideal for individuals keen on a career in software development. These e-learning modules are designed to allow students to explore and understand concepts in the scrum framework. 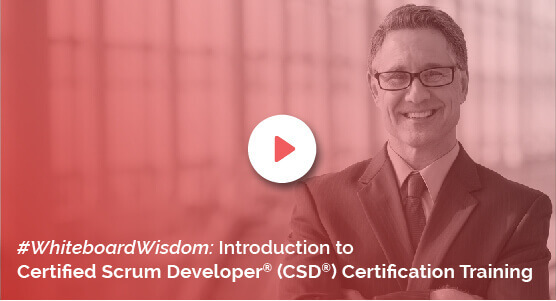 The CSD Training in Chicago is a useful certification for middle-level professionals who are under pressure to update themselves with the latest developments in the scrum framework. The CSD Course in Chicago provides online training that will give our candidates a competitive edge to stay ahead of the rest of the field. The certification training provided by KnowledgeHut will definitely make you an indispensable asset to your organization. The Certified Scrum Developer Training in Chicago is a course that is in high demand among aspiring scrum software developers. With formal training, candidates can assure of staying ahead of their contemporaries in this highly competitive scenario. KnowledgeHut courses are equipped with world class faculty, an interactive learning environment and online resources that are made available 24x7. The Certified Scrum Developer Certification ensures you with access to world-class training at a reasonable price. The KnowledgeHut program has an intensive course material that ensures your passing exams on the subject with relative ease. The KnowledgeHut course for scrum developers is a great investment for professionals looking for a long career in software development.